Are your rose leaves turning red? 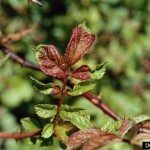 Red leaves on a rose bush can be normal to the growth pattern of the bush; however, this can also be a warning sign of big problems. 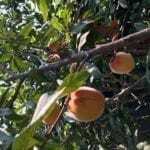 It is good for the rose loving gardener to know the difference between the normal growth and the warning of a big problem that has come to your home garden or rose bed. Keep reading to learn more about what causes leaves to turn red on roses. The new foliage of many roses starts out a very deep red to nearly purple in color. From this new growth comes the forming of buds and future beautiful blooms. Every time we deadhead our roses (remove the old blooms), we will see this new foliage coming forth. 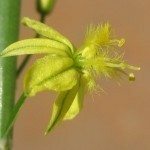 Its rich and healthy coloration is truly a joy to see, as we know blooms will soon follow and also we know the bush is happy and healthy. The deep red foliage will typically change over to either a deep or light green color as the new foliage ages. On some roses, the deep red coloration of the leaves tends to move to the outer edges of the leaf and stays there. It may appear that the edges of the leaves are burned in some manner. Taking a closer look we will see that there is a nice glisten to the outer edges of the leaves that matches the green portion of the leaf or leaves. The textures of the two areas and that little glisten tell us that things are okay. If the darker edges of the leaves appear dry or broken, however, it could be heat stress burn or chemical burning. When Jack Frost comes to visit our rose beds, his cold touch can damage the tissues of the leaves on the bush when a heavy enough frosting happens. 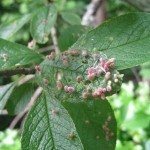 This damage can cause the foliage on the rosebush to change coloration as the foliage dies, turning it red in color, which then tends to turn a mottled red and yellow coloration. This, too, is a normal thing to witness in the rose bed or garden as the weather changes with the seasons. Now if that growth turns a bright red (sometimes may also look mottled) as well as the foliage looking distorted, elongated and/or crinkled up, we may have just been given a warning sign that something is very terribly wrong! It could be that some herbicide spray has drifted over onto the foliage or it could be the warning sign of the start of the dreaded Rose Rosette disease (also known as Witches Broom). Once the bush is infected with the Rose Rosette disease (virus), it is doomed. The bush and the immediate soil around it must be taken out and destroyed, tossed in the trash. 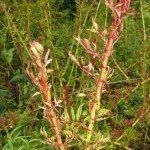 It is a fatal infection with no known cure; and the sooner the bush is removed and destroyed, the better for the other rose bushes in your garden or rose bed. Many folks have purchased the highly popular knockout roses since they first came onto the market. They are truly beautiful easy-care rose bushes and highly disease resistant. Unfortunately, they have shown that they are also susceptible to the terrible viral Rose Rosette disease. When the knockout rose bushes first came out and questions came from new owners of these wonderful bushes having red foliage, it was typical to tell them it was all normal to the growth of the rosebush. Now we must stop and ask more questions as to the appearance of the foliage and growth rate of the new foliage and canes. It may not be normal at all and instead is a warning sign that we need to act right away to keep it from spreading. Enjoy those pretty new deep red leaves that show us healthy growth with the promise of beautiful blooms to come. Just be sure to take a closer look at it to be certain as to the health of it.